In the meantime, a couple of ‘opportunities’ have arisen; in other words – we need some good PhD students to tackle some outstanding issues with the project. Arbuscular mycorrhizal fungi are naturally occurring soil fungi that colonize the roots of 90 % of plants and form a symbiosis. These fungi interact with plants via their roots for nutrient exchange, which is beneficial to both the plant and fungi. This poorly studied interaction between soil structure, plants and fungi improves the uptake of otherwise immobile soil mineral nutrients, water relations and disease resistance among plant species. They are vital for the establishment and growth of many species of trees. 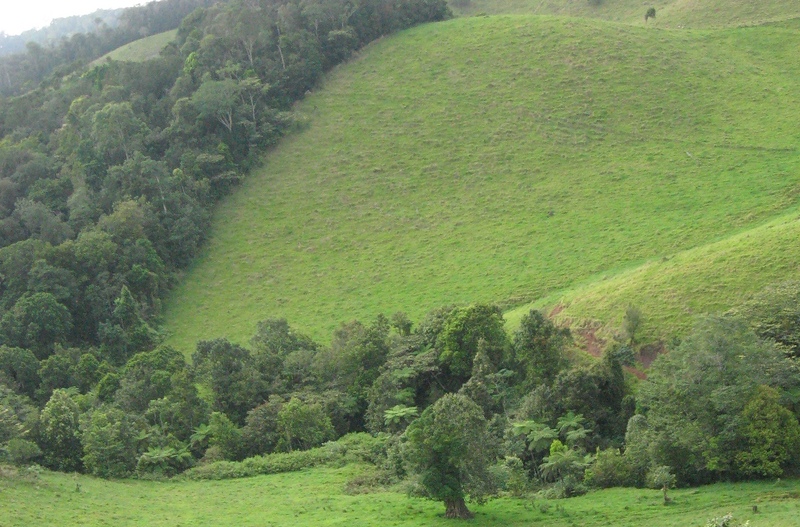 The Thiaki Rain Forest Restoration Project has been established in far north Queensland in the Atherton Tablelands, and we need a PhD student to undertake some fundamental research on this topic. The restoration project is a fully replicated experimental study, and includes research into flora, fauna, soils, carbon sequestration, nutrient exchange and others, and is backed by an Australian Research Council Linkage Grant and four industry partners over the next four years. This is a great PhD research opportunity for anyone keen to stamp their name on this rapidly evolving field. Your qualifications would need to include at least mycology, molecular biology, biochemistry, soil ecology or genetics, and you will be required to do field work at Thiaki. Enquiries can be directed to Dr Noel Preece or Dr Sandra Abell-Davis at James Cook University. Just a note too – there are also opportunities for a good student to obtain scholarships through the University of Adelaide, so that is another avenue for prospective students to consider taking. Vertebrate fauna are affected by and affect rain forest restoration. Species occurring in grasslands are very different from those from rainforests, but the species composition, trends as the rainforests are restored, the functions of vertebrate fauna and the ways in which they affect restoration are poorly known. The Thiaki Rain Forest Restoration Project has been established in far north Queensland in the Atherton Tablelands, and we need a PhD or Masters student to undertake some fundamental research into this topic. This is a great PhD or MSc research opportunity. Your qualifications would need to include be in zoology, terrestrial ecology, biology or related field and you will be required to do field work at Thiaki. Enquiries can be directed to Dr Noel Preece or Dr Sandra Abell-Davis at James Cook University. So, anyone looking for an exciting PhD project with the appropriate backgrounds should make enquiries forthwith. More about the history of the project can be found here. I was originally thinking only of the area involved, but your bringing up the time element makes me think of another aspect. For 5 years then there will be acute assesment. In the longer term – are there plans to revisit the site(s) a further 5, 10, or even 20 years hence? My original ‘scale’ question comes back to area and you’ve precisely indicated this measure. So the best inferences from the results will be applicable first to Aussie Tablelands. How large a region is this? Absolutely – we plan to follow the work through for at least the next 25 years, funding permitting. Yes, it’s a particular elevation and forest type, but is perhaps representative of around 1000-2000 km2 in the region. I think the Atherton Tablelands cover > 2000 km2. What’s the scale of the planned project? Time or area? Time = 5 years initially (but only 3 for student projects). Area = 9 blocks of 8 randomised treatments within 50 x 50 m grids.